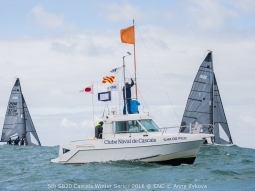 Four consecutive years of SB20 Cascais Winter Series prove stable growth of the Class in this Portuguese sailing mecca. After another fantastic season filled with action, wind shifts and strong international presence the future is clear: more teams, more action and higher level of service and competition. 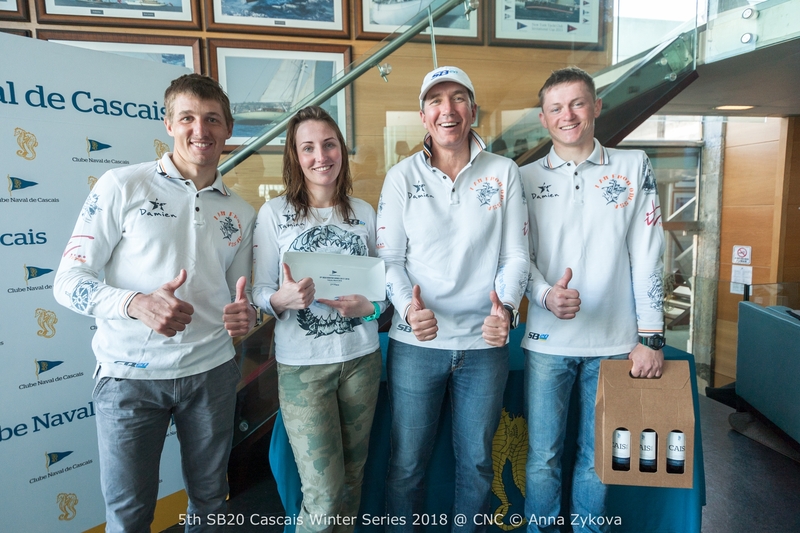 And the last event of the season that concluded on 24-25th March was another one to remember, where team Mobiag/Animal took first with Ukranians of iTParfume winning the overall Winter Series 2017/2018. Day 1 saw only 1 race as started with two 1-hour postponements after the gusty ocean wind allowed to call the fleet to the sea.The boats found their way to the course under 18 to 22 knots from North/NorthWest. At the starting gun a gust of 25 knots was sweeping the course and with the pin favoured and the boats willing to take the right handside of the course the progress was slow. The 49er and Star Portuguese Olympian Diogo Cayolla together with Jorge Lima, 49er Olympian in Rio cleared a beautiful start on Port. They were followed by Animal/Mobiag of Vasco Serpa on their tail and the Ukrainians of Petrovski Anatolii who started closer to the Committee and took the right earlier. As predicted the wind shifted to the right and the leading pack at the 1st mark was formed by this group. Ukrainians first, followed by Cayolla, Lima and Serpa. iTParfume set the shut and sailed a clean and fast run gaining a small and nice lead. At the bottom gate Team Animal overtook first Lima with a late spinnaker drop and Cayolla on the mark rounding. Things seemed to be over but they were not..
Animal/Mobiag managed to close a little bit the gap and kept the pressure on iTParfume by the windward mark. And then another strong gust hit the course with both boats flying beautifully. On what it was probably the last jibe the Ukrainians got into trouble, loosing control of the boat and their spinnaker hit the water. The local teamof Animal/Mobiag stood up solid, kept flying and stole the gun from them. It is always beautiful to see teams racing and fighting in heavy winds as these two teams did it that day. Jorge Lima sailed for a strong third place and José Paulo Ramada built on the race to finish fourth. The 2nd day started with strong breeze again, a bit more to the North than previous day, ranging from 17 to 25 knots that allowed beautiful 3 races to be sailed. Team Anima/Mobiag was the most solid scoring a 5, 2 and 1st finish. Together with the win on previous day the local team finished at top of the table with 4 points. 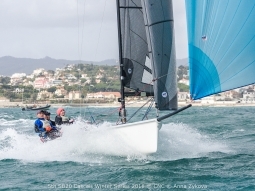 Sailing consistently is the key in these shifty and heavy conditions with confident boat handling. “In these conditions we are very comfortable. We sail together for a long time and that gives trust in each other to just do the right thing. We stay in contention and grab it when others fall into a mistake,” – says satisfied Vasco Serpa, helmsman of the current Portuguese Champions team. 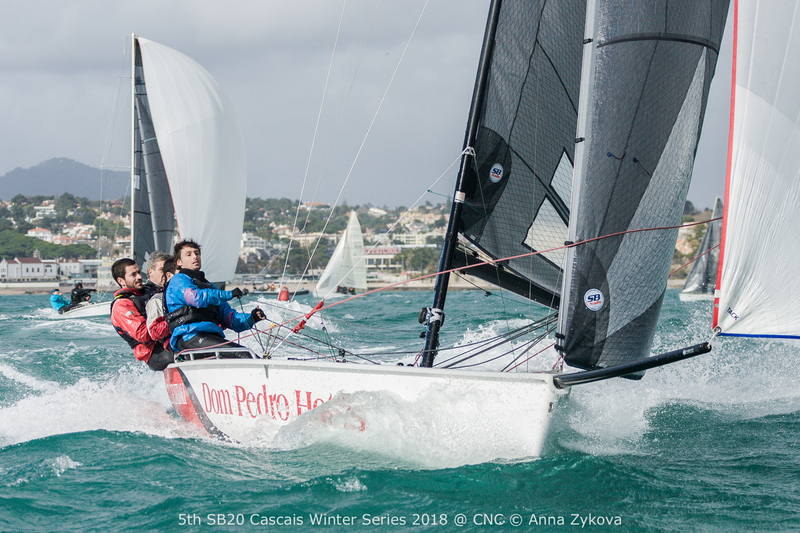 With their second place in the 5th event the team iT Perfume of Anatolii Petrovski from Ukraine won the 2017/18 SB20 Cascais Winter Series. The team sailed a very consistent series with 2 wins and 2 second places in 4 of 5 regattas. A very strong beginning of the season for this team that is aiming at leading the international results in SB20 Class this year. “We love to come here, and we will keep coming. Just a bit tired after a day like today,” – said bow/jib trimmer Anna Kyselova laughing. The season in Ukraine is just about to start and at least 7 events in SB20 class in planned for this year. In third place Team Dom Pedro/Generali of José Paulo Ramada lost their chance in the last race when suffered from loosing boat control for moments on the first run. 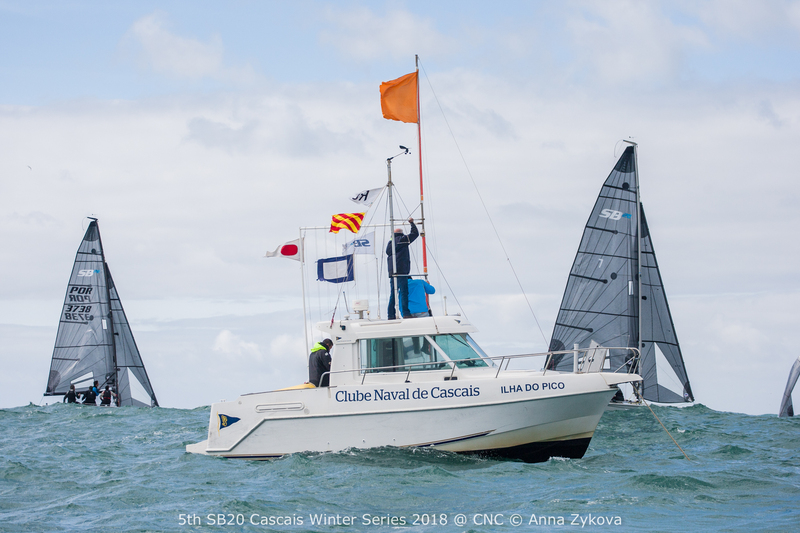 A huge success this season Winter Series in Cascais, with an established fleet of 30 boats and with a consistent attendance by foreign crews. The season hosted teams form Ukraine, Russia, France, Belgium, Netherlands, Switzerland, Ireland, Turkey, Latvia and of course the grown Portuguese fleet that involves more and more new members. 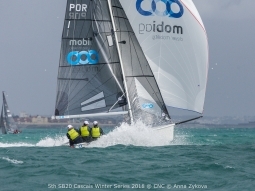 Winter is done in Portugal for this year and looking into the next year Series the case is for further growth as teams are talking about moving boats to Cascais and SailCascais is providing good quality boats and attract top teams. Now it is time for Spring! 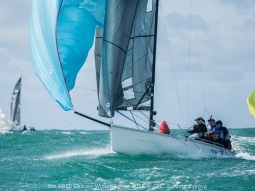 And the Portuguese calendar is loaded with events starting as soon as in two weeks with the 1st SB20 Spring Cup in Cascais. Congratulations to all the sailors, Clube Naval de Cascais, SB20 Portugal and SailCascais for the amazing work done! 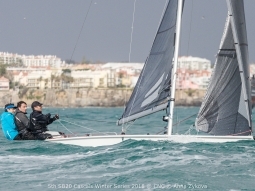 4th SB20 Cascais Winter Series delivered: a video!